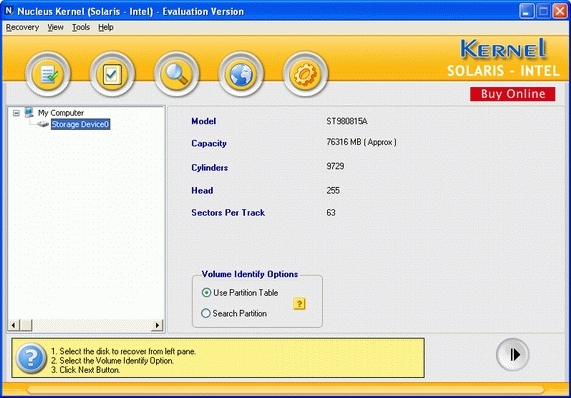 Kernel Solaris recovers data from deleted formatted damaged or corrupted partitions where unix based Sun Solaris operating system is installed on the hard disk.During recovery process a complete scan of the damaged solaris drive is performed to locate and revive the lost deleted partitions files and folders. After the complete scanning the data found in the damaged disk is displayed in a tree like structure from where you can easily copy your recovered files to a working disk or volume. 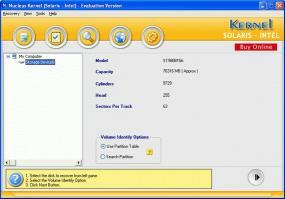 Kernel Solaris - Sun Solaris Data Recovery Software uses quick algorithm for searching and restoring lost deleted partitions files and folders and hence is a fast simple and easy to use unix data recovery software which helps you to recover your lost data and files in minutes in case of solaris disk crash or data loss disasters and hence supports your business continuity.  Key features include : Recovery from corrupt VTOC or OLT table Recovery from damaged cylinder group Recovery from damage caused to data structures by FSCK. Kernel Solaris supports UFS File System for data recovery. Kernel Recovery for Solaris INTEL is advanced data recovery tool which provides full scan of your whole drive for corruption in file systems and missing files and folders and checks the possibility of data recovery. Kernel Recovery for Solaris INTEL is the most competitive tool for data recovery which allows you to preview the recoverable contents found in the scanned partition in tree like structure and you can check whether the file is recovered correctly or not by double clicking on it.